Olajide "KSI" Olatunji isn’t your average 21-year-old. KSI is currently living in a high-rise flat in London, has an orange Lamborghini and is awaiting the arrival of a Jacuzzi that will be airlifted to his flat by helicopter. And he has all of this thanks to YouTube and his video-gaming expertise. "Essentially, I'm a 21-year-old who's a millionaire through gaming, vlogging and my online experience," KSI told Vice as part of its gaming documentary, Yo, I'll Take It! Although KSI seems to splurge when it comes to cars and his vast shoe collection, before he moved out on his own, he paid off his parents' house. KSI didn't become a millionaire overnight. When he was a teenager, he started out playing video games in his bedroom and uploading them to YouTube. As his fan base grew with subscribers, so did his ad revenue and sponsors. 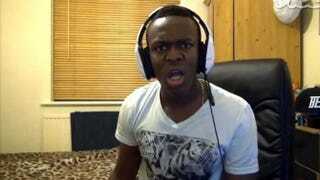 So much so, KSI dropped out of school to pursue a full-time gaming career. According to Business Insider, as of March, KSI had almost 8.9 million subscribers to his YouTube channel and over 1.5 billion views. KSI considers himself a brand and is now doing everything from acting to launching businesses. And to think, it all started with playing "FIFA" in his bedroom.